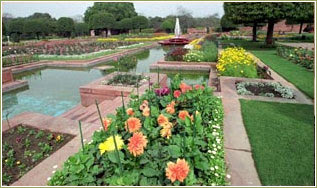 Mughal Garden is one of the best place to visit in New Delhi.This is located in Rashtrapati Bhavan area. As we know mughal garden opens for public every year in Feb-March months. Entry into this Garden is free. For Maintenance The Mughal Gardens is remains closed on all Mondays. However, the last Monday 18th March 2013 would not be observed as maintenance day and the Gardens will remain open for visitors. The Entry and Exit is via Gate No. 35 (North Avenue), This is located at the extreme end of the Church Road, this is about 300 meters west of Cathedral Church. Although there is facility to deposit these things near entrance gate but there is a lot of rush in the lines, so it is advisable to leave these articles at your home.